Egypt's Coptic Pope Tawadros II sent a message of faith and hope and a prayer for peace and unity in a short video following the Minya terror bus attack which left seven dead and ten others injured. "On this day, we are suffering to see a number of our sons killed and wounded on their way to the Saint Samuel the Confessor monastery," he said. “On the hope of the resurrection we bid farewell to them and know that God controls all events in all our lives." Tawadros II extended his condolences to the families of the martyrs and also his support to the families of the wounded. He also thanked Egyptian President Abdel-Fattah El-Sisi, who earlier conveyed his condolences to the families of all the martyrs. He also thanked all ministers, especially Minister of Health Hala Zayed and Minister of Social Solidarity Ghada Wali, for providing health and social care for the victims. Wali said that the ministry will provide EGP 100,000 to the families of the deceased, along with EGP 50,000 for those with serious injuries and EGP 2,000 for all those injured in the incident. 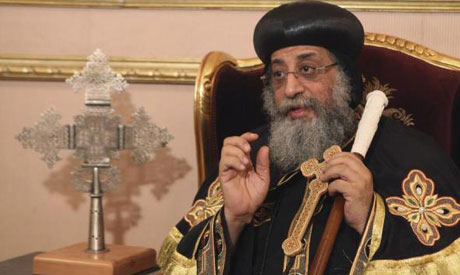 Tawadros II highlighted that he is in constant contact with the Bishops of Minya, Sohag, and the monastery to provide all the needs for the families of the martyrs. "We know that such events do not only affect us as Christians, but they affect the entire Egyptian society and we know that the most precious thing we have is our unity and our cohesion," he said. "We pray for the martyrs and for the injured, and for the safety and peace of our country. We pray for the perpetrators who are used to such incidents that cause grief, pain, and distress," he concluded.